CUMBERLAND — Fleeing slaves finding their way north likely found a resting place and a bit of food and drink beneath Emmanuel Parish of the Episcopal Church in Cumberland. The low-ceiling, often-narrow tunnels are all that remain of Fort Cumberland, and over the years, an abolitionist rector turned the tunnels into a stop on the Underground Railroad, the route that escaped slaves followed to freedom. “We should take pride in the role this church may have played in that freedom,” said Bernard Wynder, president of the NAACP of Allegany County. Wynder said that while most communities are “communities of differences,” everyone can come together to achieve common goals. U.S. Sen. Ben Cardin, 6th District congressional candidate John Delaney and Wynder toured the tunnels Sunday. The church ran tours through the Heritage Days weekend for $2 a person. The tour was popular during Heritage Days, parish staff said. The cool church and tunnels provided relief from the 90-degree heat and humidity outside. About 1,000 adults and 500 nonpaying children under the age of 5 took the tour through the weekend, parish staff said. The Rev. David Hillhouse Buel, an abolitionist and Underground Railroad activist in Maryland, came to Emmanuel as rector in 1847. It’s believed that he worked with an escaped slave, named Samuel Denson, to help other escaping slaves, according to Emmanuel’s website. Denson decided to halt his own path to freedom so that he could help other escaping slaves. The church became another stop on the foot-powered rail line. “It was a place to hide away and be stored away until it was time to move across the Mason-Dixon Line,” Wynder said. “Victory finally won out,” he said. A key lesson of the underground railroad is “that we are all human beings,” Wynder said. The extensive tours included information on the history of the church and its Tiffany stained-glass windows, the parish role in the Underground Railroad and more. "The drive for freedom is the spirit of America,” Cardin said. “They risked a great deal ... in America; we know the risks, but we are going to keep on fighting for freedom,” Cardin said. Tour guides didn’t speak with absolute certainty, since solid proof is lacking, but the scenario is very likely. After all, heavy penalties could be imposed on those helping escaped slaves find their way to freedom. Most of what we know about the underground railroad in Cumberland are stories passed down from generation to generation by word of mouth. 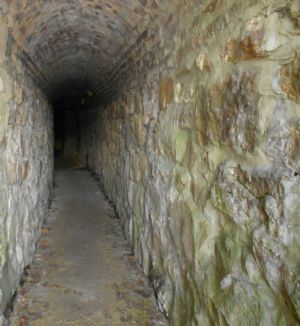 The tunnels range under the church and one crosses under Washington Street to below the Washington Street branch of the Allegany County Library System, tour guides explained. Today, the parish engages in a number of charitable activities, including Magdalene Hospitality House and other ministries.